Whisk half of the melted butter with the fresh minced garlic, chili powder and lemon juice, and season with salt and pepper. Pour this marinade over the salmon cubes, and toss to coat. Preheat a large pan over medium high heat, then add in the salmon cubes and cook for about 2-3 minutes per side, or until golden brown and flaky. Remove the salmon from the pan and set aside. 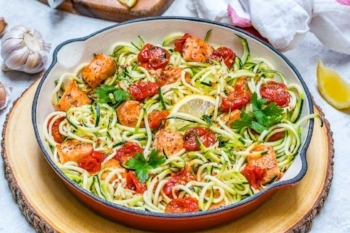 In the same preheated pan add in the remaining butter, cherry tomatoes and zucchini noodles. Saute for about 2-3 minutes, then return the salmon and very gently stir to combine to combine. Squeeze lemon juice over and garnish with chili flakes. Enjoy!